“It [cholera] must come, and we are in a dreadful state to receive it. As the result of 20 years as a successful hardware merchant, Seabury enjoyed wealth, success, and prestige. The economy was booming, and Seabury’s prosperity put him solidly in the elite merchant class. He had a comfortable home on Dey Street to accommodate his wife and five children. Yet the city was changing. The continued commercial growth, and the sudden influx of immigrants, who often had no choice but to accept low-paying jobs, resulted in overcrowding, poverty, and poor sanitation. Many of Seabury’s colleagues had already moved north to escape the congestion of downtown. As the cholera approached, Seabury no doubt thought long and hard about how to ensure the health and safety of his growing family. Unlike many in his circle, he had yet to acquire a country retreat. During the summer of 1832, familial concern must have driven Seabury to either his family farm in West Hempstead, Long Island; or perhaps he had learned by that time of a property in Black Point, New Jersey, later known as Rumson. A pleasant steamboat ride led to a 650 acre farm, and surroundings that were ideal: fresh air, clean water, sea breezes, and all a safe distance from the city’s dangers. He officially purchased the property on September 17 for $13,000. 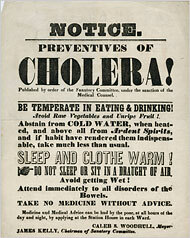 Although New York City had endured several epidemics prior to 1832, cholera was a stranger to its shores. Yet, its 250,000 inhabitants knew the city was ripe for it. The heaps of garbage, mud, and animal excrement that filled the streets were nicknamed “Corporation Pudding” by the residents, whose own overflowing privies contributed to the noxious vapors, or “miasma,” that clouded the air. The water from city wells was tainted; only the poor, who could not afford to purchase spring water from outside the city, drank it. 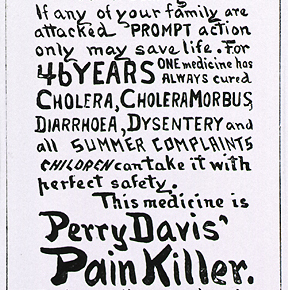 During the cholera epidemic, they did so with fatal results. The tightened ships’ quarantine enacted in the winter of 1831-32 by Mayor Bowne limited Seabury’s access to the goods he was shipping and receiving. The quarantine was ineffective in preventing the arrival of cholera, however, because ships carrying passengers entered through the back door of nearby ports, such as Perth Amboy, and their customers boarded ferries to New York without any resistance from authorities. The 10-year absence of any epidemic had lulled the Board of Health into a state of almost total indifference. The Board was considered to be a reactionary one, coming alive only in view of an imminent threat. Medical knowledge was sorely primitive, and physicians lacked the resources needed to combat such an onslaught. Merchants knew that epidemics were bad for business (one group calculated they would lose $3,000-$5,000 per day), and pressure from them no doubt contributed to the Board’s slow response to the outbreak. Vibrio cholera, the bacterial organism that causes cholera, is spread through contaminated body fluids, which, due to poor sanitation, can be found in shared food and water supplies. As the discovery of germ theory and knowledge of contagion were years away, cholera’s etiology was unknown; its violent, acute onset and horrifying symptoms were terrifying to witness. Profuse diarrhea preceded severe vomiting, dehydration, a sunken appearance, and a bluish tinge to the skin. The unquenchable thirst led victims to scream for water; and uncontrolled spasms that wracked their bodies in the final stages were excruciatingly painful. Death occurred in a matter of hours. On July 2, the news exploded: the first case of cholera in New York City had finally been confirmed. Panic ensued. The following day, the Board of Health formed a medical committee to track and report the daily spread of the disease. 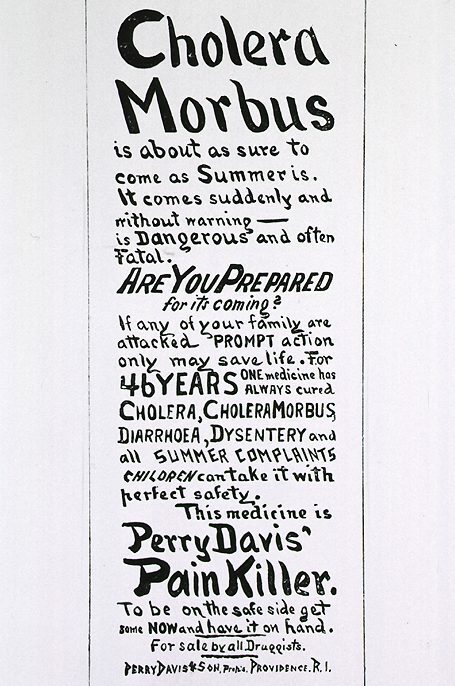 The Special Medical Council, consisting of seven prominent city physicians, drew up a list of recommendations for the prevention of cholera, which was distributed in handbills and published in the city newspapers. The normally raucous Independence Day celebration, as reported by Philip Hone, was non-existent. Within several weeks, city officials established 5 emergency cholera hospitals in schools and other buildings. The ferocious spread of cholera that battered the city left physicians overwhelmed. The epicenter of the epidemic was the 6th Ward, which included Five Points, the notorious slum inhabited largely by African-Americans and Irish immigrants. On July 20 alone, at the height of the epidemic, 100 cases were reported. Disgusted by the indifference of city agencies, a group of benefactors decided to take action to assist those devastated by the epidemic. At a meeting held at the Merchants’ Exchange on July 16, 1832, a new Committee of the Benevolent was formed, and raised thousands of dollars over several days. N.&H. Weed, a store located at 191 Pearl Street, was one of many throughout the 15 wards designated as a food and clothing collection site. In August, as the number of cases began to decline, the refugees returned, businesses reopened, and life resumed much as it had been before. By September it was over, but not before the death toll had reached 3,515. Once the danger was passed, the Board of Health resumed its passive role. Two more epidemics would strike New York City before officials discovered how to contain cholera. 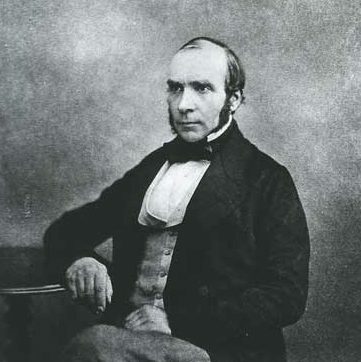 It would be another 17 years before Dr. John Snow, a British physician, proved that cholera was spread by contaminated water. Owing in large part to his likely escape to Rumson in the summer of 1832, Seabury Tredwell and his family were spared the anguish of cholera. Albion, Robert. 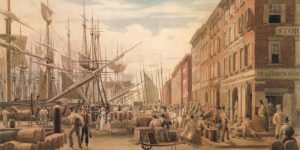 The Rise of New York Port [1815-1860]. New York: Charles Scribner’s Sons, 1939. Atkins, Dudley, M.D., Ed. 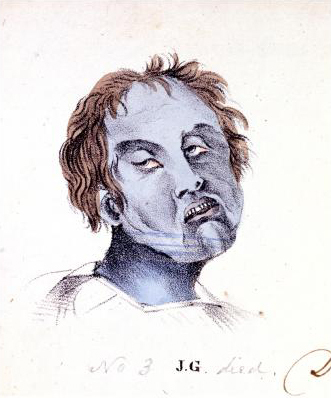 Reports of Hospital Physicians, and other documents in relation to the Epidemic Cholera of 1832. New York: G&C.&H. Carvill, 1832. Gabrielan, Randall. Rumson: Shaping a Superlative Suburb. Charleston, SC: Arcadia Publishing, 2003. Gilman, C.R., MD. Hints to the People on the Prevention and Early Treatment of Spasmodic Cholera. New York: Charles S. Francis, 1832. Greene, Asa. A Glance at New York. 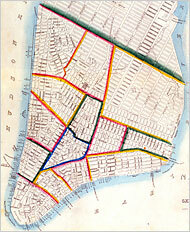 New York: A. Greene, 1837. Cholera File, 1832. Board of Health MSS. Municipal Library, New York City Department of Records. Minutes of the Board of Health, September 6, 1831. MSS. City Clerk’s Papers, Municipal Archives and Records Center. 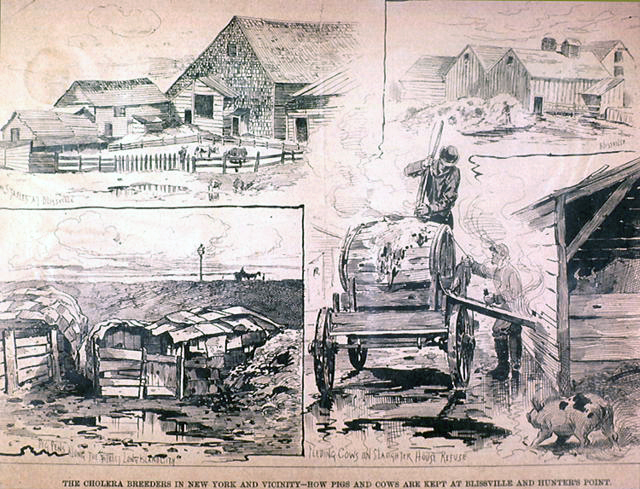 New York Evening Post, various dates: February-September, 1832. www.newspapers.com. accessed 7/6/16. Rosenberg, Charles E. The Cholera Years. Chicago: The University of Chicago Press, 1962. Spring, Gardiner, D.D. A Sermon, Preached August 3, 1832, A Day Set Apart in the City of New- York for Public Fasting, Humiliation, and Prayer on Account of the Malignant Cholera. New York: Jonathan Leavitt, 1832. Sterns, John, MD. Concerning the Cholera Epidemic. MS 170, 1832, The New York Academy of Medicine Library Manuscript Collection. Students of Rumson High School. History of Rumson, 1665-1944. Rumson, NJ: The Historical Committee, 1944. Tuckerman, Bayard, ed. The Diary of Philip Hone. New York: Dodd, Mead and Company, 1889. Thank you, Ann, for this! Extraordinary research and so interesting! This is the sort of thing that is drained from our collective memory of those times, I’m afraid. It’s so good that you have brought it to our attention. And I believe that there is enough here that we can now make a legitimate inference that Seabury Tredwell did buy the Rumson property in response to the cholera epidemic. This article is worthy of publication beyond the Merchant’s House blog. Don’t know where, but there must be some place. Excellent work in every respect, Annie. I second Mary’s belief that this deserves wider distribution. My great-great grandparents died in the cholera epidemic in New Jersey. My great-grandfather was raised by another family, so we are not certain if the surname was “Boyd” or “Wright.” Is there a list of people who died from cholera after April 1832? I have the Patterson list for 1832-1833. The NJ Municipal Archives may be useful. The NYC Municipal Arcives contain original records of the cholera victims, including those hastily scrawled lists kept by the physicians who treated them. Good luck with your research!